The 8% levy on insurance premiums extension from the MTPL class to a;; the facultative non-life insurance lines in Slovakia started to produce effects on the insurance premiums, reports The Slovak Spectator, mentioning especially the vehicle and travel insurance premiums. The Slovak Government and Parliament made several changes to the tax system with effect from 1 January 2017, some of them affecting also the local insurance companies, as well as their foreign shareholders. The recently adopted amendments concern - among others - corporate and personal income tax, value added tax, special levy in regulated industries, as well as social security and health insurance contributions, reads a Kinstellar report published by the Lexology portal. Belgian banking and insurance group KBC is interested in looking for acquisition opportunities in Slovakia, in line with its plan to expand in its core markets in central Europe, KBC Group Chief Executive Johan Thijs said on Wednesday. The Slovak government's decision to extend the 8% tax, previously applied only to the MTPL insurance premiums, to all the facultative non-life insurance lines has raised not only insurers' discontent, but also a negative reaction of CESMAD - the Association of Road Transport Operators of the Slovak Republic. In short, Slovak hauliers blame the recent change in taxation for the sharp increase in the mandatory motor insurance prices. Slovak insurers have ended 1H2016 with an overall GWP volume inferior to the previous year's results for the same period. According to the market representatives, given the Slovak market's stability during the recent years, the end year market results should be more or less in line with the 2015 results. Last year, the Slovak insurance market totaled EUR 2 billion, down by 4.1% y-o-y, as the preliminary statistics published by the National Bank of Slovakia (NBS) indicated. The life insurance field decreased by 9.6% y-o-y due to the 18% depreciation of unit-linked subsegment, while the non-life GWP was up by 2.8% to EUR 965 million. ALLIANZ Real Estate (ARE) has acquired 100% of the shares of Central Shopping Center in Bratislava from IMMOCAP Group, a Slovakian real estate development company, for around EUR 175 million. It is the first real estate investment of ALLIANZ in Slovakia. The Slovak insurance decreased 3.6% y-o-y during January-September 2015 to EUR 1.53 billion, according to the financial figures published by the National Bank (NBS). In the analyzed period, life insurance decreased by 8.4%, to EUR 798 million, while the non-life insurance segment was up by 2.3%, to EUR 740 million. In 1H2015, the Slovak insurance market totaled EUR 1.06 billion, while the value of paid claims by local insurer was EUR 586.4 million, according to the financial figures published on the NBS's web-site (National Bank of Slovakia). More in detail, the life insurance field generated more than half of total GWP (51.3%), while the non-life classes accounted for 48.7% of the market (EUR 516 million). 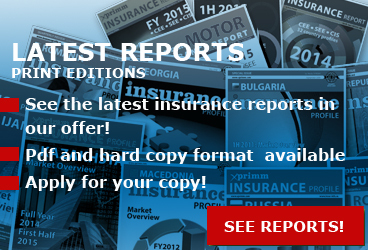 In 1Q2015 the Slovak insurance market totaled EUR 614.20 million, 4.43% up y-o-y, the statistics published by the National Bank of Slovakia (NBS) indicated. The value of paid claims increased by 4.67% y-o-y to EUR 313.88 million. Yesterday, CSOB Leasing and Volksbank Leasing International reached agreement for CSOB Leasing to acquire all the shares of Volksbank Leasing Slovakia and its insurance brokerage subsidiary, Volksbank Sprostredkovatel'ska. 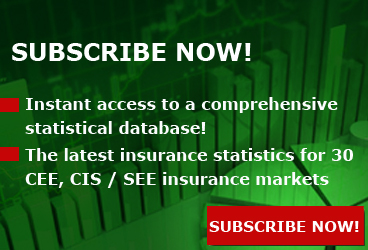 The value of aggregate gross written premiums of insurer members of Slovak Insurance Association - SLASPO has risen by an annual of 3.62% to EUR 632.29 million in the first three months of 2015, as the preliminary SLASPO statistics indicated. The Slovak insurance sector had a profit of EUR 179 million last year, according to the National Bank of Slovakia (NBS). 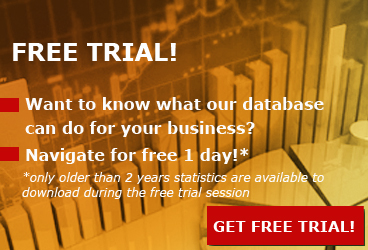 This represented year-on-year growth of 13.3 percent. The outlook for the insurance market in Slovakia remains stable and while car insurance is seeing heightened competition, the launch of payments from the second pension pillar has the potential to alter the market. 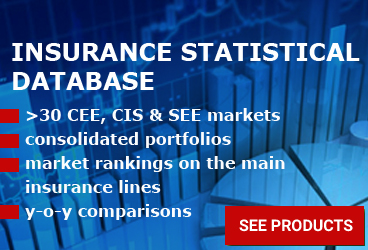 The consolidated net profit of the Slovak insurance market amounted, in 2014, to EUR 181.09 million, 13.4% up y-o-y, according to data provided by the National Bank of Slovakia (NBS). "The amount is the second highest in history, while the maximum, EUR 188 million, was reached in 2011," Julia CILLIKOVA, Director of the NBS Regulation and Financial Analysis Department, told XPRIMM. Slovak Telekom, in cooperation with the insurance company Allianz, introduced Invoice Insurance, which provides coverage in the event a person is unable to pay his monthly invoices, not only to Slovak Telekom, but also to other companies including housing fees. The service is offered in four levels, depending on coverage: 25, 25+, 50 and 50+. The impact of torrential rain, thunderstorms, lightning, hail, landslides and floods caused millions of euros in damage in Slovakia this year, and with signs that climate change is creating less predictable global weather patterns, flood insurance is an increasingly necessary investment for many homeowners and businesses. Fraud has always been a concern for insurance companies, but fraudsters are developing ever more sophisticated schemes; insurance companies, meanwhile, are responding with more effective countermeasures. Slovakia has won a lawsuit with commercial health insurance company Dovera, according to a recent ruling of the European Commission, the Trend weekly website reported on December 8. Gross written premium in 3Q2014 by the Slovak insurers went up y-o-y by 2%, to EUR 1.6 billion, at a fairly equal growth pace for life and non-life insurance segments. According to the National Slovak Bank, the market supervisor, overall the number of insurance policies grew by 4.13%, which compared with the GWP increase indicates a still highly competitive market.